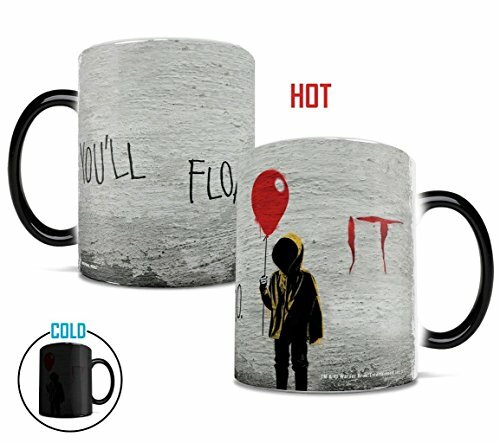 Pour hot liquid into this Stephen King's It Morphing MugsTM Heat-Sensitive Mug and Georgie appears to offer you a balloon and let you know that you'll float too. You'll float too! YOU'LL FLOAT TOO! Perfect for your own creepy cupboard or as a gift to a friend who just loves clowns and/or sewers. The exterior of this officially licensed 11oz mug transforms from black as hot liquid is added, revealing the hidden image in full vivid colors. PLEASE NOTE - Official Morphing MugsTM sold on Amazon.com should only ship from the USA. Other mugs may be counterfeit. While this mug may be used in the dishwasher or microwave, for the longest lasting, highest quality product, we strongly recommend against it. ✅ PLEASE NOTE - Official Morphing MugsTM sold on Amazon.com should only ship from the USA and NOT from 'Just Launched' sellers.